Pine Haven Christian Communities will host a community event on Wednesday, April 3rd, in celebration of National Lawn & Garden Month. This event will take place starting at 5pm in the Community Center at Pine Haven’s Haven Drive campus. At this event, master gardener Christina Wilke-Burbach will provide tips on seed starting, germination, testing your soil, designing your garden, transplanting after front, early crops and flowers to plant outside, and more. Refreshments will be provided. Celebrate National Craft Month With Us! 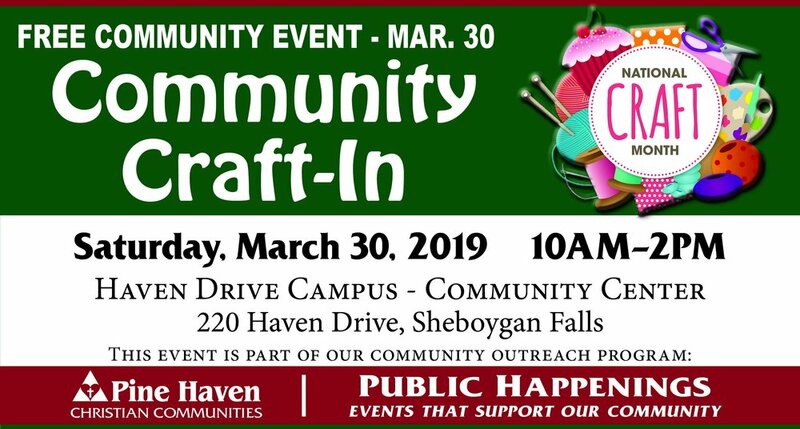 Pine Haven Christian Communities will host a community event on Saturday, March 30, 2019 from 10am – 2pm to celebrate National Craft Month. This event is designed for crafters of all experience levels – including those who don’t currently craft, but who are curious to find a craft they might like. The event will take place in the Community Center at Pine Haven’s Haven Drive campus. Folks who have a craft they already enjoy can bring their craft to work on, and enjoy the camaraderie of crafting with others. Those who want to learn about various crafts can watch people enjoying their work, ask questions, and discover new crafting possibilities. There is no cost to attend. Refreshments will be provided. Pine Haven’s Public Happenings program that provides events and/or educational sessions like this event once a month, which are designed to benefit our community. For more information, this event is listed under events on Pine Haven’s Facebook page at https://www.facebook.com/events/803670476649305. You can reach Karin Oliver-Kreft on the phone at 920-550-5227 or via email: koliver-kreft@pinehaven.org with questions, to volunteer, or to suggest a topic for future events. Kiwanis & Pine Haven provide Christmas to Local Kids in need! Pine Haven Christian Communities and Sheboygan Falls Kiwanis Club celebrated their first year as coordinators of a Children’s Community Christmas party on December 12th at the Giddings Avenue campus of Pine Haven. At the event, 24 kids from the Sheboygan Head Start program were selected to participate. Santa (played by Rick Waldbauer) gave each child a stocking filled with donated presents. He also presented each child with a large gift: the 12 boys received a hand-crafted toy wagon and a teddy bear, the 12 girls received a hand-crafted toy cradle and a baby doll. To help the children learn that giving is the meaning of Christmas, each child picked out a stuffed animal from under the tree, which they then gave to someone else. In addition, every family received a laundry basket filled with food to make a family Christmas dinner, and a recipe booklet to help prepare the meal, and some other kitchen items like a towel, an oven mitt, baking pans, and a bowl. Pine Haven residents look forward to the event each year as their chance to help share the joy of Christmas with area children who might not get much of a Christmas otherwise. They wrap the presents and stuff the stockings to be delivered – and they wear hats and sing along with the children at the event. The seniors truly love watching the faces of the children light up when they see Santa and as they open their presents. Everyone present enjoyed cookies, carols, and fellowship. Steve Hamer lent his talent as a pianist, to lead everyone in Christmas Carols. Kiwanis club members and Pine Haven staff passed out the goodies and assisted families with the gifts they received. Preparations for this event require a year-long effort. Kiwanis members reached out to the community to gather donations. Toothbrushes and toothpaste for each child was donated by Midwest Dental in Plymouth. Sheboygan Falls High School students cut out all the pieces for the cradles, using wood left over from previous years’ events where the cradles were constructed by Rick Waldbauer. These pieces were then assembled and painted by the local Boy Scouts. The wagons were made and donated by Steven and Karin Kreft, using the patterns which were used in previous years by Dave Goelzer. Dolls were donated by the Sheboygan Clinical Pediatrics Department. Teddy Bears were donated by the Sheboygan Falls Kiwanis Club. Stuffed animals, toys for stockings, blankets for cradles, hats, scarves, mittens, and stockings were donated by Kiwanis members on the event committee: Mary Blaha, MaryAnn Dolson, Sheila Kloepping, Randy & Tammy Meyer, Greg Monson, Mary Ellen Schmidley, and Jill Spielvogel, as well as through donation boxes placed at Pine Haven. Food for the family Christmas dinners was purchased with help from Blattner’s Piggly Wiggly, via a very generous donation by Plenco. So many happy faces! It was a wonderful event! Kiwanis members organizing the gifts for the boys. Each family received an overflowing basket of food for a Christmas dinner, thanks to the donation from Plenco. It was a full-house event! Residents arrived early to enjoy the event! The kids were all super excited to see Santa! Steve Hamer played piano while everyone sang carols. Each child got to pick out a stuffed animal to give away - to learn the meaning of giving. The kids were really excited to show their parents what Santa brought them. This event will take place starting at 5pm in the Community Center at Pine Haven’s Haven Drive campus. At this event, master gardener Christina Wilke-Burbach will provide tips to care for your indoor plants – like which plants you might want to select, and how to keep them healthy and thriving. Refreshments will be provided – and there may even be door prizes. On June 26, 2018, Pine Haven Christian Communities, with the full support of the Board of Directors through an official resolution, proclaimed the day to be Joan Spindler Appreciation Day - and celebrated Joan’s retirement with her in gratitude for all she has done. 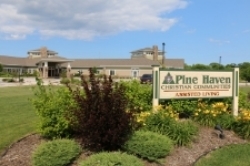 On August 4, 1974, Joan Spindler began work at Pine Haven Christian Home as a young LPN. For many of her years at Pine Haven, she has been the Medical Records Clerk. Now she is retiring, after 44 years of dedicated service - almost her entire career! Joan is a friendly, warm, and caring individual, who lovingly has used her God-given talents to serve those under her care. Her quiet dedication in a critical, “behind the scenes” role has not gone unnoticed. The Pine Haven team is extremely grateful for Joan’s willing “YES LORD” answer to God’s call. Countless lives have been blessed as Joan has intentionally lived out being a disciple of Christian principles. Pine Haven wishes God’s blessings on Joan in her retirement years, as she continues to serve God in new ways. Pine Haven Christian Communities will host a community event on Thursday, February 8th in celebration of Crime Prevention Week. 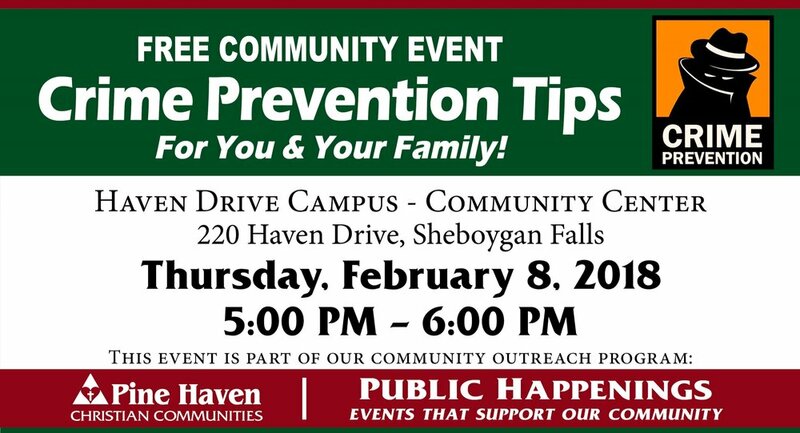 At this event, Sheboygan Falls Police Inspector Nicole Schmelter will present on crime prevention with tips to help you protect yourself and your family. This event will take place from 5pm to 6pm in the Community Center at Pine Haven’s Haven Drive campus, which is located at 220 Haven Drive in Sheboygan Falls. For more information, this event is listed under events on Pine Haven’s Facebook page at https://www.facebook.com/events/246206675919008/. You can reach Karin Oliver-Kreft on the phone at 920-550-5227 or via email: koliver-kreft@pinehaven.org with questions, to volunteer, or to suggest a topic for future events. Pine Haven Christian Communities’ August community learning event will celebrate National Coffee month in an open to the public event. This free event will be held on August 9, 2017, starting at 10:00 am in the community center at Pine Haven’s Haven Drive campus in north Sheboygan Falls. Speaking at the event will be Karin Oliver-Kreft, marketing director and coffee aficionado, who will explain the different types and characteristics of coffee roasts as well as the different types of coffee drinks. Attendees will be able to enjoy free samples of coffee – provided by Daydream Café. This coffee lovers’ celebration is part of Pine Haven’s “Learning For Life” series of educational events, which are open to the public and feature a new topic each month. The goal of these lecture series is to provide information that is of interest to the general population, offering them a chance to learn more about topics that will benefit them through life. Future topics are outlined on Pine Haven’s Facebook page, so that the community can plan their attendance in advance. Refreshments will be served. Reservations are not necessary. Event is listed under events on Pine Haven’s Facebook page at https://www.facebook.com/PineHavenChristian/. Or you can reach Karin Oliver-Kreft on the phone at 920-550-5227 or via email: koliver-kreft@pinehaven.org. Pine Haven Resident's 103rd Birthday Celebrated! Pine Haven resident Maria McTavish was featured in a Sheboygan Press article, highlighting her life as she celebrates her 103rd birthday.